The Intel Atom N280 is a typical netbook single core CPU which is clocked at 1.66 GHz. The Atom core was designed for a low power consumption and cheap production. The downside is the relative low performance per Watt (due to the in-order execution) compared to similar clocked Celeron processors, e.g.. Still the integrated Hyper-Threading (the operating system sees the CPU as a dual core CPU) decreases the penalty of the in-order execution a bit. The performance of the N280 is only compareable to a 1.2-1.3 GHz clocked Celeron M and therfore only sufficient for non demanding applications like Office or web surfing. HD videos, advanced photo editing, video cutting may not run fluently. Compared to the N270, the N280 only offers a minimal higher clock speed and a faster FSB. The performance increase should not really be noticeable. Due to the modern 45nm process (in 2009) and the small size, the power consumption is very low (2.5 Watt TDP). Therfore, the CPU does not need a good cooling system and can be used in very small designs (like Netbooks). 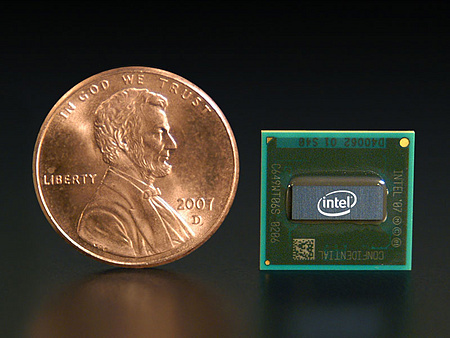 The Intel Atom 330 is a dual core CPU for Nettops (small desktop computer). Therfore, it features nearly no power saving features (compared to the netbook single core Atom CPUs). Only the C1 state is supported by the Atom 330 (no Enhanced Speedstep, C2, C4, Enhanced Stop Grand, Enhanced Deeper Sleep State like in the N270 for example). The performance of the Atom 330 is measureable better than a single core Atom N270, but still not near the slowest Celeron Dual Core CPUs. Therefore, the 330 is only suited for non demanding tasks like web surfing, or office. In conjunction with the Nvidia ION Chipset (9400M graphics), the Atom 330 powered system can be used for non demanding 3D games in low settings and watching HD videos (with the right software). The successor of the Atom 330 is the Atom D510 with an integrated memory controller and an integrated GMA 3150 graphics card (again only intended for Nettops).